Yes, now I am going to complain about the cost of things in London. "You know, London is really expensive." I can't count the number of times people told me that when I said I was moving to London. In fact, I did already know that. Just to back up the assertion, a March 2008 survey by Swiss bank UBS found that it is, in fact, the most expensive city in the World, outpacing such outrageously expensive competitors as Oslo, Dublin, Copenhagen and New York. Despite knowing that, I am planning on writing about how expensive things are. In fact, I came up with the clever title "A £ of Flesh," and seeing as I am probably going to write about how expensive things are in the world's most expensive city a lot, I have already decided that this post will be first in what will probably be an excruciatingly dull, navel gazing and self-indulgent series of blog posts. So, in the future if you see the title "A £ of Flesh" and don't wish to hear about me gripe about the price of stuff, you can just skip it and wait for something more interesting. First, though, some good news, which is that things aren't as expensive as I had feared. This is due to two things, both based on my past visit to London in August of 2007. First, as I am in the "outer boroughs" of London and not right in the heart, things aren't priced for tourists and rich bankers, but rather for regular folks. Secondly, in 2007 it took 2 and a half Canadian dollars to buy a Pound Sterling. That has now dropped to 2 Canadian dollars for a Pound Sterling. The nightly news talks about Britain's slow decline and the devaluation of the pound against international currencies, but I am loving it. Anyway, I have found that some things are priced around the same as Canadian prices, like Coke in 2L bottles and pints of beer in bars. Some things seem to be about 2 times the going Canadian rate, which sadly includes housing. But I was expecting that. I got my first real shock today when I went to wash my dirty clothes. 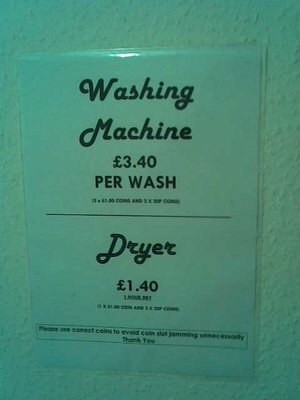 £3.40 for a wash?!? In Canada the most I paid was $2.00 for a wash, which works out to somewhere around £1.00. 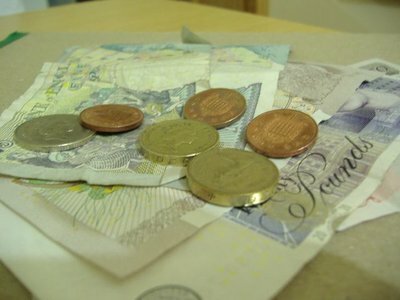 Even a £1.50 I would have put up with, but when the price of laundry is THREE-AND-A-HALF TIMES the Canadian rate, I had to balk. Unfortunately, all the walking I've been doing meant that my clothes were... umm... ripe, so not doing Laundry was not an option. So I sucked it up and did a wash. 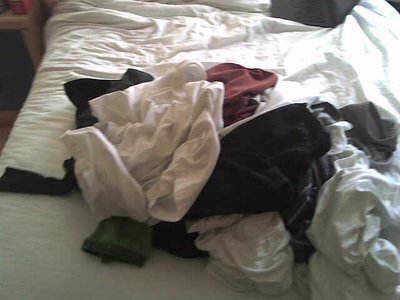 I did something, though, that I haven't done on purpose since I first learned to do laundry, and had only done once before by accident, an accident that resulted in all my white shirts turning a light pale colour of pink. I washed my whites and colours together and crossed my fingers that nothing would bleed. I think the reason it's so pricey is that 90% of London homes have washing machines, so most people don't need to bother with laundrettes.